Warm up with a bowl of comforting soup. Here are 17 recipes so there will be plenty of great options to keep you going the rest of winter! Soup lovers unite! Enjoy bowl after bowl of soup to keep you warm from the inside. Here are some great recipes to keep you going all winter long. Pick out some of your favorites today! 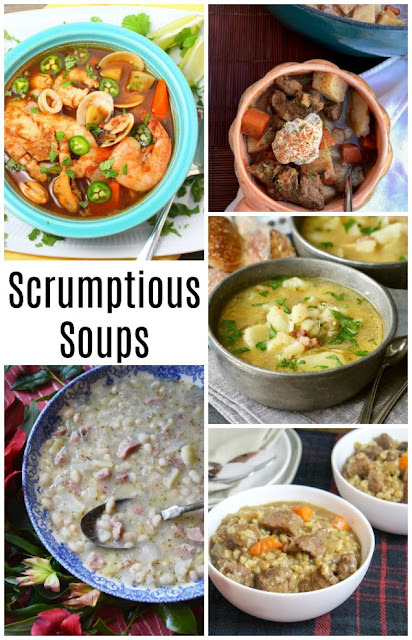 My Celebrate365 friends and I hosted a virtual soup swap a couple of weeks ago and I thought I would share some of my favorite recipes with you. If you need even more recipes, be sure to check out the original post. There are more than 70 recipes there! Crock Pot Loaded Potato Soup from The Farm Wife Feeds - I love a good slow cooker recipe. This looks so creamy and delicious! Sausage and Potato Cheddar Ale Soup from Living on Cloud Nine - This one has had me hungry since the first minute I saw it and Andrea is the sweetest thing. Be sure to go check out the soup and the rest of her blog! Slow Cooker Creamy Potato and Ham Soup from Blogghetti - It looks like I have a thing for creamy potato soups and it's probably because I do. I could eat these kinds of soups every day during winter. Slow Cooker Creamy Chicken Tortilla Soup from The Spiffy Cookie - When I need a break from creamy potato soups, I like to go for a good tortilla soup! You'll love this one too! Chicken Noodle Chowder from Ally's Sweet and Savory Eats - I love chicken noodle soup and I love chowders. I have never tried them together. Have you?! Chicken and Wild Rice Soup from Oak Hill Homestead - Mmmmm, I can almost taste the comforting goodness from here. This is sure to be like a warm hug for your taste buds. Kelly's Cheese Soup from Cooking With Carlee - This is one of our absolute favorites. It is a copycat recipe based off a legendary restaurant in our area. 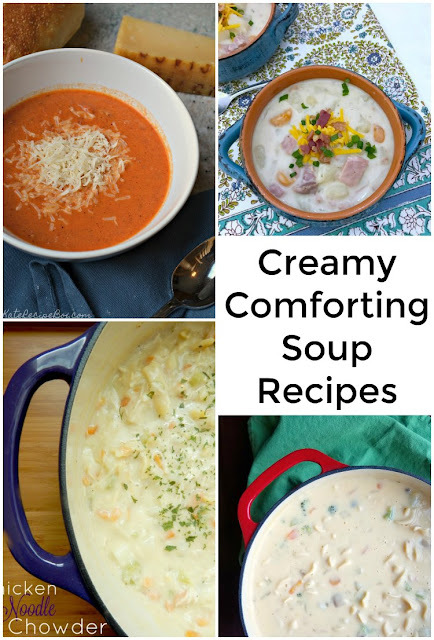 It is loaded with goodies and so creamy and delicious. Tomato Asiago Soup from Kate's Recipe Box - Just imagine a creamy tomato soup with the added oomph of Asiago! Crispy Chicken Tortilla Soup from The Baking Fairy - Soups that are full of flavor and texture are always my favorite and this tortilla soup really looks like it fits the bill. Slow Cooker Beef Minestrone from Tip Garden - A nice bowl of minestrone is just what the doctor ordered on a cold winter day. Potato Soup with Fried Almonds from Karen's Kitchen Stories - This looks so different than the other potato soup recipes in the list. The fried almonds are so intriguing too. Let's make a pot for ourselves! Slow Cooker Beef and Barley Soup from Cheese Curds in Paradise - Now I need to get some barley. I can't believe I've made it this far into winter without picking some up! German Goulash Soup from Savory Moments - I have been wanting to make more German recipes and this looks like a fabulous place to start! Mexican Seafood Soup from Palatable Pastime - This looks so good, just take a look at that picture and see how it goes! Italian Asiago Artichoke Ham & Bean Soup from Faith, Hope, Luck & Love - Ham and beans is such a classic, can you imagine adding artichokes and Asiago? French Onion Soup from The Redhead Baker - Another classic that is sure to warm you up. It's not just for restaurants, you can make it too! Beef Noodle Soup from Cindy's Recipes and Writings - This looks so yummy. What a great way to take the edge off a cold day! Theses all look amazing! Several of these I pinned from the Soup Swap! 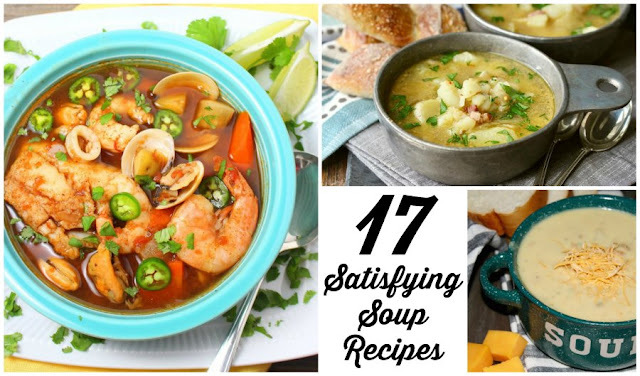 I love a good bowl of soup, so I would love to try them all! choosing which to start with is going to be the hardest choice! I know, that's the worst part of having so many great options! So many options! Warm weather is coming so I better get started making a few favorites.